Born in Reading, Pennsylvania, Joseph Derr is a self-taught artist. Over the past several years he has worked with many different media including bronze, ceramics, oil and acrylic painting and even constructions made from household utensils. 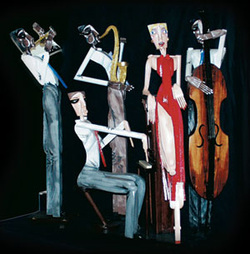 Mr. Derr is best known, however, for his creative and whimsical wood sculptures. These unique pieces of art are hand crafted from start to finish. Depending on his latest inspirations, the final outcome can be a single elegant diva, a dancing couple or an entire vignette of figures in mini-settings of different themes. Working from a preconceived idea, Mr. Derr builds his figures from pieces of hand-cut wood that are nailed, glued and doweled together. He then primes and paints the details in polychromes of vivid colors. The active brushstrokes he uses bring life to the figures, and from the raw materials emerges an image with a strong presence and often a lot of attitude. These lighthearted abstract figures have been a favorite of collectors of contemporary art for almost ten years. Viewers in search of escape into a playful imaginary world will find these sculptures captivating. Mr. Derr has exhibited in New York, Philadelphia, Lahanna, Hawaii, Las Vegas, Key West, Miami, Bermuda and Acapulco. His sculptures are in collections worldwide. He has also won awards in New Orleans and Pennsylvania. The artist is now working and living on the Gulf Coast.